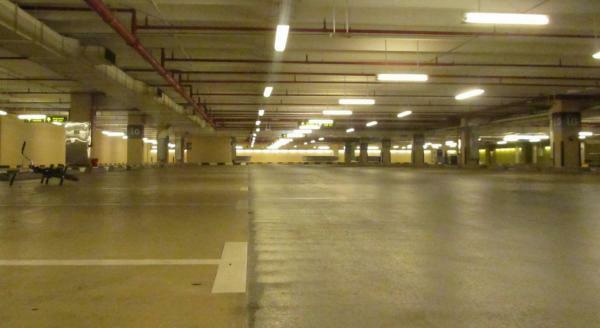 The spot is located under the (Mid Basement) parking lot when you take the elevator, that is located in the main entrance of Geant Hypermarket which is on the Ground Floor, You just need to ask one of the security guards to lead you to the Basement level, the spot is mostly clear at weekdays (sunday, monday, tuesday, wednesday) and it's really crowded with cars at weekends (Thursday, Friday even Saturday) means they are a lot of cars parked. and i'm the only one who rides here.. there are no local flatland riders in Kuwait, [ADDITIONAL INFORMATION] You cannot ride on the ground floor i had some trouble with the security guards telling me it's not allowed to ride bikes there because it's the main entrance and people are shopping there. and going out and in so i have to find and ride somewhere else so i did.. and the ground floor i used to ride on before was the same surface as the new one i ride on right now. which is located on the (Basement). It's nice and chill there not so many people passes by and calm great for concentrations! for more brief details you can find me on Skype (My Skype is xbozurk) or contact me via email BozurKCS@gmail.com thank you for reading this!